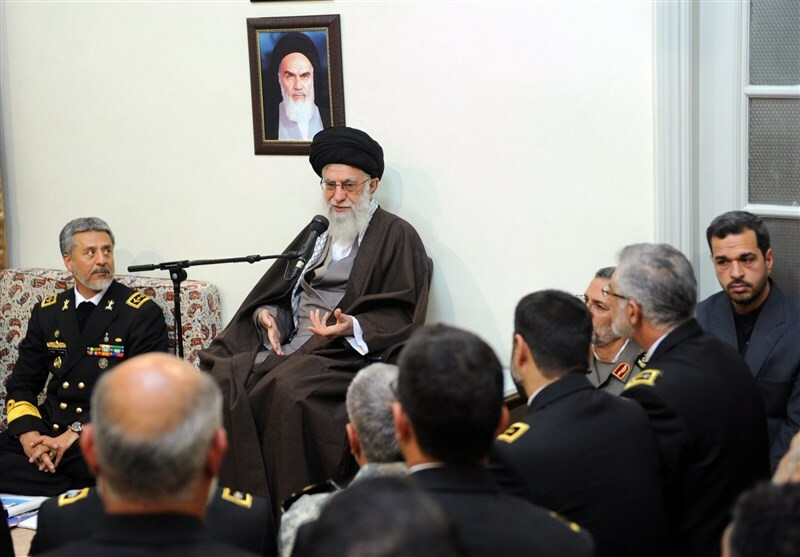 Leader of the Islamic Revolution Ayatollah Seyed Ali Khamenei called for enhancement of the Iranian naval forces’ presence in international waters and expanding the Navy’s power in balance with the merit of the Islamic Establishment. “Our country has long maritime borders and a long history of seafaring. Thus, the power and capability of the Islamic Republic’s Navy should be in line with the merit and level of the Islamic Establishment and the country’s history,” Ayatollah Khamenei said Sunday in a meeting with the Navy’s commanders and officials on the occasion of the national Navy Day. Ayatollah Khamenei described the Navy’s mighty presence in international waters as a factor that contributes to the strength and capability of the country, stressing that the depth of such presence should be increased. In recent years, Iran’s naval forces have increased their presence in high seas to secure naval routes and protect merchant vessels and oil tankers against pirates. Earlier this month, the Navy’s 44th flotilla of warships sailed around the African continent and entered the Atlantic Ocean for the first time. There are also plans for Iranian Navy vessels to sail across the Atlantic Ocean in the future. Elsewhere in the Sunday meeting, Ayatollah Khamenei referred to Washington’s plans to renew sanctions against Iran, reiterating that such a move would be a breach of the JCPOA (Joint Comprehensive Plan of Action- a nuclear agreement between Iran and world powers). The Leader dismissed the notion that it will not be new sanctions but renewal of previous sanctions. “There is no difference between starting a sanction and restarting it after it expires and the second one also constitutes a violation of previous commitments by the other party (to the JCPOA),” the Leader said. The comments came after US lawmakers passed a bill on November 15, renewing sanctions on Iran for 10 years. The House of Representatives voted 419 to one for a 10-year reauthorization of the Iran Sanctions Act, or ISA, a law first adopted in 1996 to punish investments in Iran’s energy industry. On Wednesday, Ayatollah Khamenei had said that the implementation of the anti-Iran bill will translate into a breach of the JCPOA, warning the US government that Iran would certainly react to it.